Applied Computer Science: Happy Birthday, Romania! Today is our national day, we celebrate 95 years since all the provinces inhabited by Romanians were reunited in a single state. Since that time some parts of those provinces were lost after the second world war, the most important part being Basarabia, which was part of USSR after the war, but now it's an independent country, Republic of Moldavia. The good news is that in the last years the government of Moldavia decided to pursue the integration of the country in the European Union and just a few days ago they signed an important commercial agreement with the EU. The weather is not very nice in this part of the year, so we just took a walk outside, but I noticed much more many flags at the windows then in other years. The politicians did their show as usual, eager to attract some sympathy from the public. 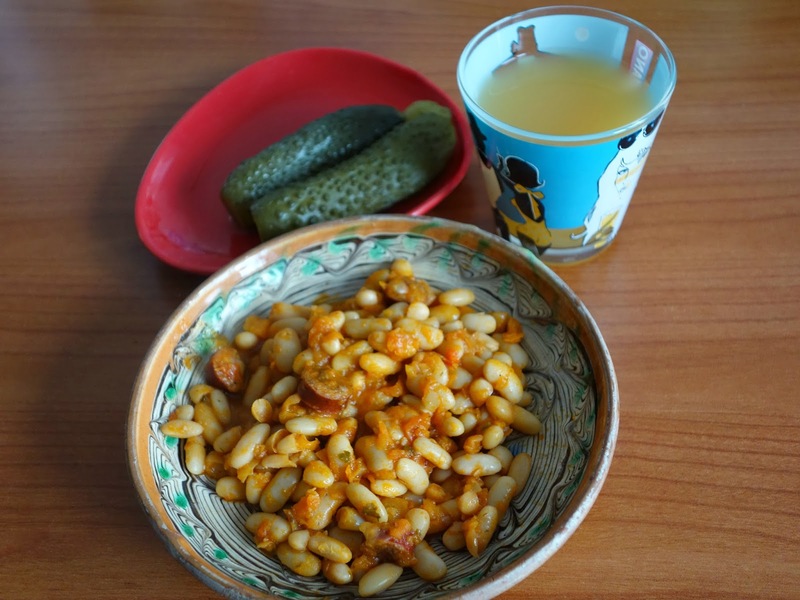 In many cities they organize nowadays public gatherings for this day where often food is given away for free (most popular are beans with sausages and stuffed cabbage), so we decided to have for lunch today a similar menu: beans with sausages, pickles and a delicious apple juice from Itesti.